WCLT - Nature Notes 2/26/2010 - Who’s out there? With its color and feather pattern matching the tree bark, an eastern screech owl hides in plain sight during the day. Most screech owls in our area are gray like this one, but they also come in a rusty red color that matches reddish bark. All things considered, Westborough’s woods are pretty tame and quiet. You’re never far from the sounds of civilization – traffic on a highway or a local road, a train traveling the railroad tracks, a helicopter overhead. Even so, you might occasionally hear strange and unearthly sounds – odd whinnying that you know isn’t coming from a horse, or spooky wailing. What could possibly be making these mysterious sounds? Most likely, it’s an eastern screech owl (Otus asio, Megascops asio), even though the sounds don’t seem like screeches. These small owls, only about 6-10 inches high when perched on a branch, live in our woods year-round. The wailing and whinnying are nothing to fear. They’re the songs of the screech owl. This time of year – February and March – is the breeding season, when you might even hear them during the day. Screech owl males use the whinny song to claim territory, which is important in attracting a mate. You might also hear this song in late summer or early fall, when adult owls once again claim their territory as part of encouraging their grown youngsters to leave. The wailing song is a softer, wavering, one-note sound that males and females often use between them. Males also use it to advertise a nest hole. Screech owls also make other sounds, including hoots and screeches. Hoots are usually alarm calls. You probably won’t hear a screech unless an owl has to defend its nest or young. Like other owls, screech owls hunt at night, dawn, and dusk. During the day, they sleep perched upright in a tree hole or on a branch, near the tree trunk. They’re well camouflaged by feathers that match the color and pattern of tree bark. 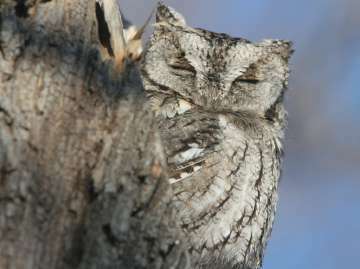 This camouflage helps to keep these small owls safe. We think of owls as birds of prey, with deadly talons and swift silent flight, but screech owls are small enough to become prey themselves. During the day, hawks can take them. At night, they need to fear larger owls, such as great horned owls and barred owls, and even other screech owls. Tree holes are very important to screech owls, not only as places to roost safely every day, but also for nesting. For this reason, you’re likely to find these owls in areas with mature trees. They don’t make their own holes, but they’ll use natural holes or old woodpecker holes. They’ll also use crevices in buildings or nest boxes, such as wood duck boxes. European starlings and northern flickers compete with them for nest holes. 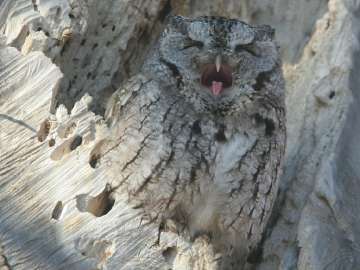 This eastern screech owl yawns as it naps in a sunny spot in a big knothole. But if a small bird sings nearby, the owl turns its head to look and listen for a chance to capture it. Nesting may seem like the wrong word for what screech owls do. Males find and advertise several possible nest holes early in the breeding season, as part of courtship, but once a pair chooses a hole, they don’t exactly build a nest. The female simply lays eggs inside the hole. Screech owls pair up for several breeding seasons or even for life. Typically, a female lays three to four eggs over the course of a few days or a week or so. The female usually begins warming them after the first or second. About a month later, the first two or three eggs laid hatch around the same time, but the last 1-2 hatch later. This pattern of hatching at different times is typical of birds of prey, including owls, hawks, and ospreys. It leads to behavior that’s probably not too surprising in birds of prey. The older, more mature chicks manage to get more of the food that both parents work hard to bring. The younger chicks are weaker, don’t compete well for food, and often lose out altogether. They often get killed in the struggles or starve, and their older siblings eat them. Sometimes, the mother kills and eats the weakest chick. Young screech owls use their beaks, legs, and wings to climb out of the nest hole after about 4 weeks, but before they can fly. In this stage, known as “branching,” they sit on branches and hop from branch to branch. The parents still feed them. The young owls are safer in the tree branches because nest predators (such as snakes, raccoons, and opossums) tend to notice the comings and goings at the nest hole. As the young owls learn to fly, they follow their parents on hunts. Screech owls use a sit-and-swoop style of hunting. They sit motionless on a perch, watching and listening for prey. Then they swoop down on it, flying silently thanks to the soft feathers on leading edges of their wings. The youngsters get started by swooping down and seizing insects on the ground. Screech owls have broad tastes in food, and this is one reason for their success. They prey on mice, squirrels, rabbits, birds, bats, snakes, frogs, and earthworms, as well as insects such as beetles, moths, crickets, and cicadas. They’ll even pluck fish out of shallow water. If you spot a screech owl, it’s likely to be gray because most screech owls in our area are gray, like most local tree trunks. But they also come in a rusty red color. In the South, where there are more red tree trunks, the red screech owls are somewhat more common although still a minority. The gray and red screech owls are similar in other respects, including their voices. Because they can and do pair up to breed, they’re considered the same species. Screech owls are town and country owls. They get used to people, and in some areas they fare better in the suburbs than in deeper woods. Why? The suburbs have fewer predators (such as bigger owls) and less competition for prey (from hawks, for example). Screech owls hunt profitably in the “edges” where woods and open areas meet. They do need tree holes for nesting and roosting, but they’ll use substitutes, such as bird boxes with entrance holes about 2.8 inches wide. They like to bathe and even use birdbaths.